The sight is equipped with the digital block of illumination (seven gradation of brightness) of TMR reticle and automatic control of reticle level (build-in to the field of view), that allows to make high-precision shooting in the place with the complicated horizon level (for example: mountains hunting). The housing and mechanisms of sights are made of high-strength alloys, providing necessary durability on guns with big caliber, including .375 H&H, .338LM, .50BMG. 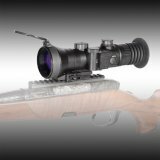 Special optical system of the riflescope provides the image quality and angular permission on a midfield equal to models of well known deserved brands. It has the reliable mechanism of adjustments with accurate tactile click and the wide range of adjustments and accessible 7 levels of digital brightness control of an aim point with storing of the last value and automatic shutdown of illumination of an aim point. This is a universal and irreplaceable assistant on different types of hunting, as foiling hunting and stalk hunting. 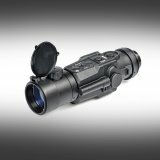 At 1x magnification and 20 ° field of view the device is used as a full-fledged collimator sight, allowing to observe and aim instantly and surely at near distances by two eyes, and 7x magnification allows to recognize and hit surely the target at long distances. The day sight is equipped with the digital block of illumination (seven gradation of brightness) of TMR reticle and with automatic control of reticle level (build-in to the field of view), that allows to make high-precision shooting in the place with the complicated horizon level (for example: mountains hunting). The housing and mechanisms of sights are made of high-strength alloys, providing necessary durability on guns with big caliber, including .375 H&H, .338LM, .50BMG. The improved version of the legendary Falke L.E. with an anti-loss locking mechanism.This sight fits on all Picatinny/Weaver mounts, it is protected by metal-covers for hard use, absolut recoil and waterresistand, it can be used in any climate. It has 3-5 levels of brightness, parallaxfree even on close distances because of optimized lense technology. 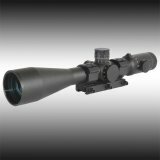 Dedal-520, -541, -542, -552 night sight attachments install in front of day riflescope objective or other optical device (the field-glass, a telescope, photo/video equipment). 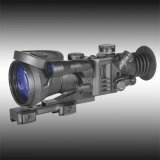 Dedal-NV attachments have small weight, that allows fix them directly on day riflescope objective (field-glass) through a transitional ring or on the provided mounts (usually Weaver standard). Night attachments using scheme provides the best quality of the image, big range of detection and recognition, than use of universal devices day/night and night devices behind an eyepiece of a day sight. 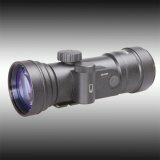 This night sight attachment install in front of day riflescope objective or other optical device (the field-glass, a telescope, photo/video equipment). 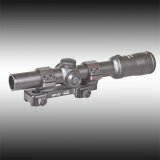 It has small weight, that allows fix them directly on day riflescope objective (field-glass) through a transitional ring or on the provided mounts (usually Weaver standard). 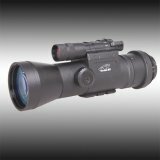 Installed night vision riflescope attachment Dedal-54x in front of a daytime sight does not affect the latter’s zeroing. It is executed on high contrast technology (special calculated optical scheme and optical glasses, toughening of admissions during producing and assemblage of the lenses). Using of a black-and-white luminophor of the tube provides bigger comfort of supervision and reduce the tiredness of an eye especially in winter conditions, but in certain cases (supervision in the summer wood, in the field) use traditionally yellow-green range of a luminophor provides big distance of supervision and recognition of the target owing to feature of a structure of an observers eye. 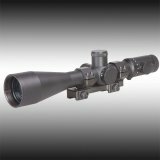 This riflescope assembled in the metal strong housing, has weight 560 g ONLY, but at the expense of a lens executed on technologies of high contrast (see information about Dedal-490), rather big optical magnification (3.7х) and installed Gen.III tube, riflescope provides distance of night shooting to 450 m in moonless dark night. 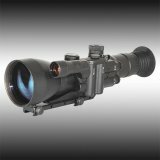 You can install various IR-illuminators with their own independent power supply at this riflescope. Additional IR installs on Weaver/Picatini standard rail. The mount for the weapon is delivered, as a rule, without rigid mounting to the sight housing, that allows to realize special adaptation of the device to concrete model of the gun. The sight assembled in the ceramic-metal strong housing and reliably work at big calibers (.375H&H, .50BMG) and at the same time, allow providing small weight of a sight. Exit pupil removal is 50-90 mm, that allows to provide safe shooting on big calibers without loss of quality. Dedal-490 objective is executed on high contrast technology (special calculated optical scheme and optical glasses, toughening of admissions during producing and assemblage of the lenses). That provides 20 % more contrast of a target/background in comparison with night rapid optics installed in Dedal-480 series. 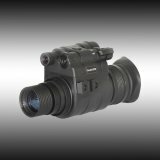 Dedal-370 device represents the multipurpose compact night vision monocular, intended for night surveillance, search, photo and night hunting, and in the conditions of the low illumination. The device can be carried on the head, helmet, connected to photo/video equipment for shootings of night animals and documenting of illegal activity. Also you have a possibility of connection two devices in to binocular. 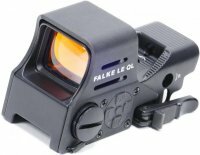 The device can be equipped with quick-release mount and can be installed behind collimator sight (EoTech, Aimpoint) on Weaver/Picatinny mount. 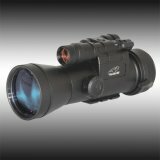 Set of changeable rapid optics (from 1х to 10х) and powerful tube (Gen. II+, III or XR-5) allows to achieve a distance of night detection up to 1000-2500 m.
Prices are tax, unless otherwise indicated. Photos, videos, logos or texts on this site are copyright of the producer or distributor and is forbidden to use it to spread further, or take control of this site without written permission MilitaryZone.eu.